We all want to speak the truth with love and walk the line between being a habitual enabler and a judging Pharisee. In the Gospels, Jesus carried out this task of admonishing the sinner with three steps: looking, loving, and challenging. Look – see the person as they truly are, with full acknowledgement of their wrongdoing. Love – remember that they are loved and deserve to be treated with dignity and respect. Challenge – challenge them to do better for themselves, which will ultimately make them happier. We see these steps in action in John 8:3-11, when Jesus interacts with the woman caught in the act of adultery. This method of truth spoken in love (look, love, and challenge) is a great way to carry out the spiritual work of mercy of admonishing the sinner. For more tips on admonishing the sinner, check out Fr. Josh’s podcast. Colin is an enthusiastic transplant to vibrant Louisiana, where he lives with his beautiful wife Aimee and two energetic children, Leo and Zélie. 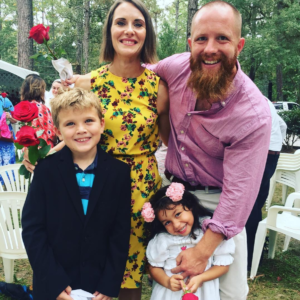 His juggling act involves being a husband, a dad, a teacher, a youth minister, a musician and a national Ascension content creator and trainer. In his spare time, he eats too many crawfish, savors king cake, plays one-on-one kickball with his son, and tries, for the life of him, to properly load the dishwasher. Check out Colin’s latest work with Ascension: Power and Grace: A Guide to the Catholic Sacraments and Quick Catholic Lessons with Fr. Mike. Becoming Dust Jackets for Truth: The Art of Storytelling!